Barry Martyn, transplant bandleader and jazz drummer, offers “The Fabulous George Lewis Band: The Inside Story” at LSU Press Holiday Book Sale in Baton Rouge. BATON ROUGE, Louisiana — Barry Martyn, bandleader and jazz drummer for more than 50 years, welcomes a moment of discovery from a visitor at the LSU Press Holiday Book Sale. The annual book shopping experience, along with a meet-and-greet the authors, is being held at the Baton Rouge Gallery. Baton Rouge Gallery is located in the historic City Park Pavilion. Before entering the pavilion, outside on the grounds near the well-lit tennis courts, a holiday festival with an assortment of booths are busy with lots of children and parents. Nearby, is the layout for what is described as the short, 34-par, nine-hole City Park Golf Course. The public course opened in 1928 and was listed on the National register of Historic Places in 2002. The Baton Rouge Gallery is a non-profit contemporary art gallery and one of the oldest professional artist cooperative galleries in the U.S. The pavilion which houses the gallery was originally the pool house for City Park built in the late 1920s. The pool was closed in 1963. Martyn was the super excited youth growing up in London, England, listening to contemporary recordings of American jazz, gaining in his craft as a drummer, and dreaming of the day he would cross the Atlantic Ocean to study and play at the feet of the Crescent City’s older jazz musicians. Martyn matured as a musician and became the leader of the band. 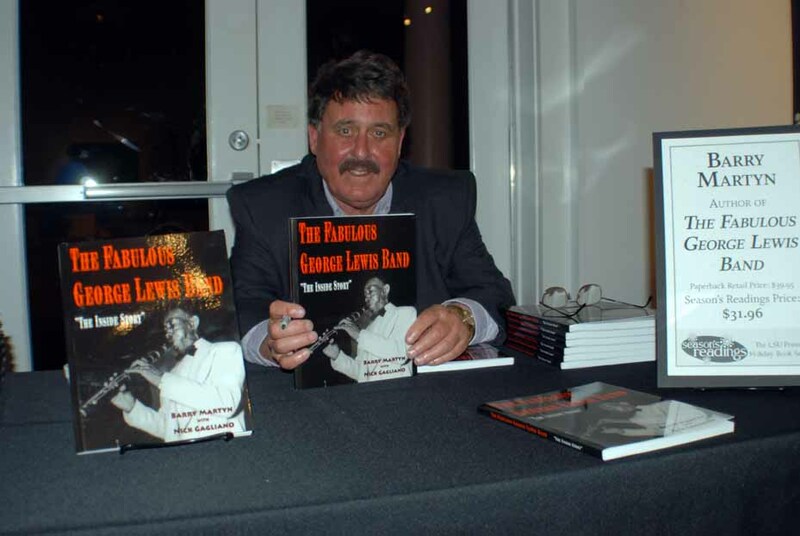 His biography says he is the author of five previous books, including “Song of the Wanderer” and “Bill Russell's New Orleans Music.” In 2007, he published “Walking with Legends: Barry Martyn’s New Orleans Jazz Odyssey.” He was the first white musician in the U.S. to join a black musicians’ union. In 1972, he formed The Legends of Jazz, an old-style New Orleans jazz band that toured the world and took New Orleans jazz into the American showbiz mainstream. It was as a player in The Fabulous George Lewis Band, however, that Martyn came of age in the 1960s. One thing for sure, in Louisiana, when it comes to politics the name James Carville, political strategist for President Clinton and other Democrats, is just as ubiquitous as Huey Long. Ask one the LSU Press staff here about the most famous author connected with the university and they will immediately answer Robert Penn Warren, so says Kahn, who taught English at LSU before retiring. Warren is author the of the novel, “All the King’s Men,” for which he won a Pulitzer Prize in1947. Wikipedia says Warren was awarded the Pulitzer Prize for Poetry in 1958 and 1979 and is the only person to have won Pulitzer Prizes for both fiction and poetry. Warren taught here at LSU between 1933 and 1942. “All the King’s Men” is based upon the life and times of Huey Long, the populist governor of Louisiana. Broderick Crawford starred as Willie Stark in the movie adaptation that won the “Academy Award for Best Picture in 1949.” Sean Penn reprised the role of Willie Stark in the 2006 film co-produced by James Carville. Carville is also credited with writing a foreword for Cyril E. Vetter’s “Fonville Winans’ Louisiana: Politics, People, and Places.” Winans was a regional photographer (1911-1992) who covered politics in this state known for its rough and tumble politics for more than four decades. LSU Chancellor Michael Martin was here earlier for the reading from and to help promote “Treasures of LSU,” which was edited by Laura Lindsay, interim dean of the LSU College of Education and professor emerita in the Manship School of Mass Communication. “Treasures of LSU,” a large-format book, was published for the university’s Sesquicentennial Celebration in 2010 and as a highlight of LSU Press’ 75th anniversary. The book features a series of interpretive essays written by faculty members, graduate and research assistants, depicting the university’s treasures through 168 vibrant photographs. “Treasures of LSU” makes for a fabulous holiday gift. Martyn’s book comes with a CD featuring the best of New Orleans jazz clarinetist George Lewis’ music from the mid-twentieth century. Martyn’s memoir tells how Lewis went from the work-a-day world of a stevedore on the docks at New Orleans to a musical career from local one-night stands to one that spawned internationally. Lewis helped establish the reputation of Preservation Hall, from its opening in 1961 in the French Quarter as a sanctuary for keeping alive traditional New Orleans jazz, until his death in 1968. Inclusive of Lewis’ story is that fame sometimes is arrived at later in life. “The Fabulous George Lewis Band” has ties to legends who flourished in New Orleans while others, like trumpeter Louis Armstrong, were embraced throughout the world, especially the London of Martyn’s youth. Nobles is author of “The Delta Queen Cookbook: The History and Recipes of the Legendary Steamboat.” an LSU Press title. The Delta Queen, a wooden steamboat, used to cruise “major rivers that constitute the drainage of the Mississippi River” and was known for its excellent southern cuisine. Nobles’ research chronicles chefs and recipes prepared for guests of The Delta Queen for more than eight decades. 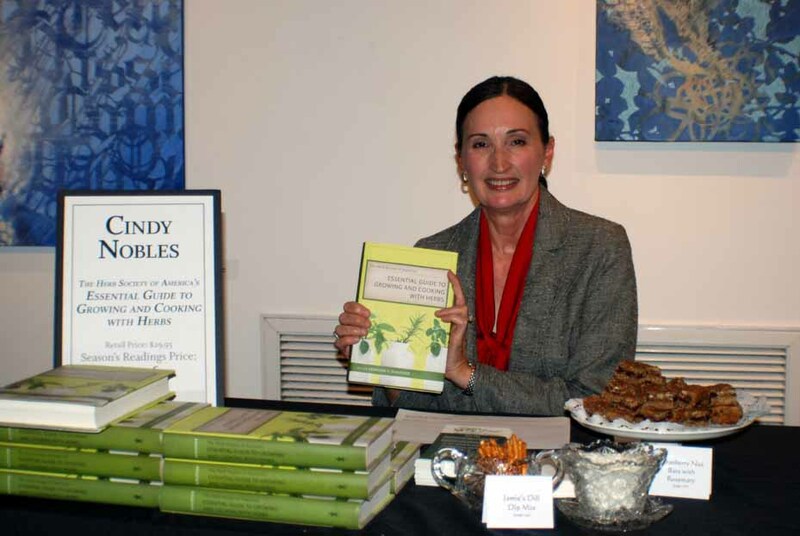 Cynthia LeJeune Nobles gave out treats and offered copies of “Essential Guide to Growing and Cooking with Herbs” during LSU Press Holiday Sale in Baton Rouge.